In the space of just three years, BMW says that the 3 Series Gran Turismo has established itself as a standalone character within the 3 Series family. It adds that it brings together the sporting attributes of the 3 Series Saloon with the elegance of the 4 Series Coupé and the functionality and versatility of the 3 Series Touring. The new 3 Series Gran Turismo has just gone on sale with prices starting from €47,580 on-the-road. Inside and out, the new 3 Series GT benefits from carefully crafted enhancements both visually and to its functionality. Ease of entry, a raised seating position with outstanding all-round visibility, and a sense of spaciousness are key qualities, along with more room in the rear compartment. Customers can expect three full-size seats and the legroom of a luxury saloon. The overall dimensions of the 3 Series Gran Turismo remain unchanged, as do the key attributes: four doors with frameless windows, the coupé-style, gently sloping roofline, and a large tailgate. However, subtle enhancements to exterior design further refine the unique Gran Turismo proposition. The new twin circular headlights define the front end, with LED headlights for dipped and high beam now fitted as standard. The front fog lamps are also now LEDs, while Adaptive LED headlights are available as an option. Together with the light graphics, the links from the headlights to the kidney grille give the front end a broader and therefore sportier visual impact. Chrome and high-gloss elements have been applied to areas such as the surround for the air vents, the buttons for the windows and mirror adjustment, and the radio and air conditioning controls. The centre information display now features a flatter design and narrower frame profile to give it a slimmer and more elegant appearance. The new engine range consists entirely of petrol and diesel units from the latest BMW modular engine family, with fuel consumption reductions of up to 14 per cent. The new generation of engines in the BMW 3 Series Gran Turismo are notable for combining performance with efficiency; all engines are now turbocharged. The line-up comprises three new petrol units and five diesel engines. 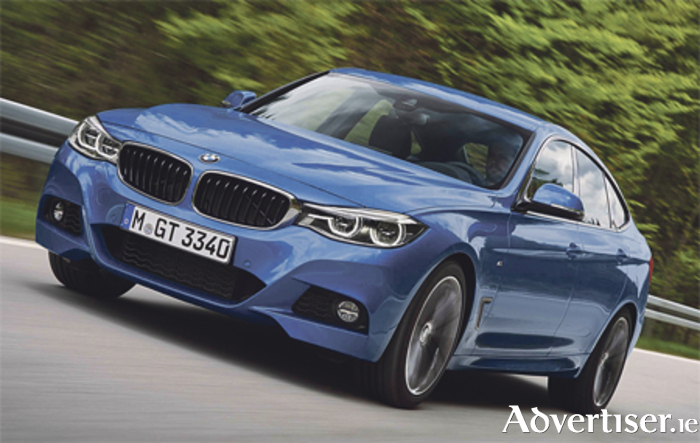 All the petrol models and two of the diesels (320d, 330d ) are available with the option of BMW xDrive, while the BMW 335d Gran Turismo comes with the all-wheel-drive system as standard. Further improved manual and automatic transmissions, on-demand operation of ancillary units, and the ECO PRO mode also help to ensure the new BMW 3 Series Gran Turismo delivers all the sporting and dynamic qualities for which the brand is renowned. The BMW 3 Series Gran Turismo features an extensive list of equipment already fitted as standard, including automatic climate control, keyless engine ignition, Servotronic steering, six airbags, LED headlights for dipped and high beam, and LED front foglamps.